Larapinta Trail Transfers is locally operated by Alice Wanderer Centre Sightseeing and is the longest established transfer service in Alice Springs. This transfer is from Alice Springs to Redbank Gorge. Larapinta Trail Transfers is locally operated by Alice Wanderer Centre Sightseeing and is the longest established transfer service in Alice Springs. This transfer is from Redbank to Alice Springs. Larapinta Trail Transfers is locally operated by Alice Wanderer Centre Sightseeing and is the longest established transfer service in Alice Springs. This transfer is from Alice Springs to either Ormiston or Glen Helen. Larapinta Trail Transfers is locally operated by Alice Wanderer Centre Sightseeing and is the longest established transfer service in Alice Springs. This transfer is from either Glen Helen or Ormiston Gorge to Alice Springs. Larapinta Trail Transfers is locally operated by Alice Wanderer Centre Sightseeing and is the longest established transfer service in Alice Springs. 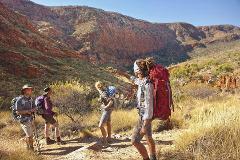 This transfer is from Alice Springs to either Ellery Creek or Serpentine Gorge. Larapinta Trail Transfers is locally operated by Alice Wanderer Centre Sightseeing and is the longest established transfer service in Alice Springs. This transfer is from Serpentine Gorge or Ellery Creek to Alice Springs. Larapinta Trail Transfers is locally operated by Alice Wanderer Centre Sightseeing and is the longest established transfer service in Alice Springs. This transfer is from Alice Springs to either Simpsons Gap or Standley Chasm. Larapinta Trail Transfers is locally operated by Alice Wanderer Centre Sightseeing and is the longest established transfer service in Alice Springs. This transfer is from Standley Chasm or Simpsons Gap to Alice Springs.